Implementing an effective security ministry will take time. It is a process that will require constant assessment and improvement. As new threats emerge, adjusting to meet these new threats will require additional training. As team members move in and out of the ministry, the new members will need training as well. We’re committed to delivering the tools you will need to implement and manage your security ministry. Take a look at the benefits you will receive with your subscription. Regardless of the size of your security team, we have a plan that will work for you. Regardless of the size of your church, you’ll get all of the benefits detailed here. Allow your team members access to our video courses on their own schedule, whenever they need to and wherever they are. Based on our experience, we know that your team will need assistance for several years to come. As we add new courses and modules, your team will instantly get access at no additional charge. Team member’s training can be tracked and verified via short quizzes at the end of each training session. Ministry leadership will be able to verify the completion of training for every member of their team. As new information related to church security becomes available, you will have access through our blog and periodic email newsletter. 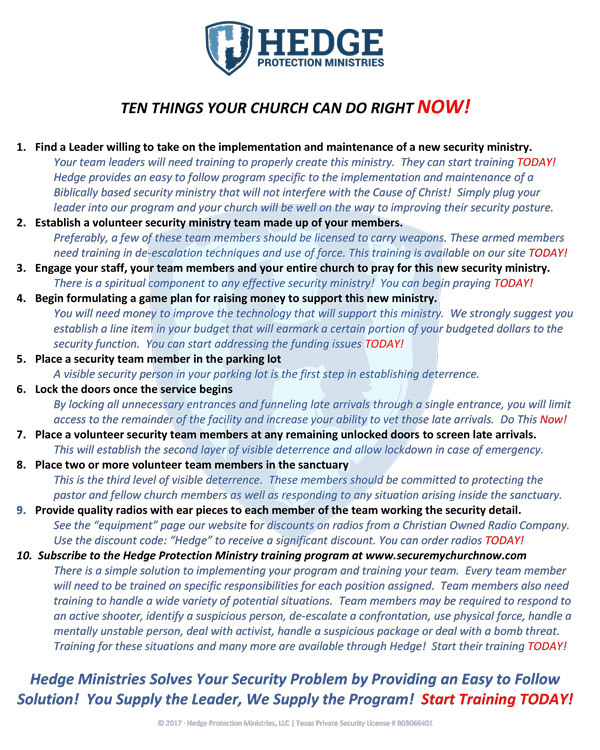 As threats arise in the church community, you will be notified with a suggested action plan. We have created an incident reporting network where you can share the details of incidents that have impacted your church. We will help you assess the incident and share what we learned with our network of members. Please note that we will always protect the identity of your church when discussing any incident. Your team will have access to various additional training opportunities through live events and podcasts. We find it especially useful to interview those who have preyed upon churches to gain insight into the criminal mind and how we can guard against it.